Fuelled by political instability and lacklustre crop prices, opium poppy cultivation is on the rise in Myanmar in a worrying trend that may undo containment strategies, the UN Office on Drugs and Crime (UNODC) warns. Poppy cultivation is also on the rise in Laos, where farmers are struggling as commodity prices fall, according to the UNODC's latest survey of opium poppy cultivation in the two countries in 2009, launched on 14 December in Bangkok. "We are worried about trends, especially in Myanmar, where we see the potential unravelling of much of what containment has produced over the past two decades," said Gary Lewis, the UNODC Representative for East Asia and the Pacific at the launch. "In the past three years we have seen incremental cultivation increases, and this is of [concern] to us ... In conclusion, containment is under threat," he said. 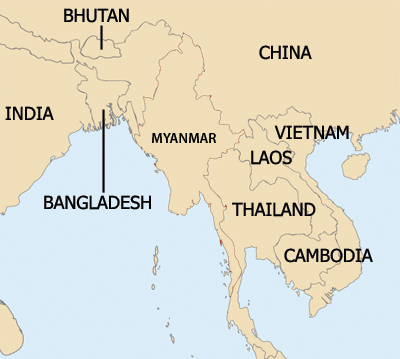 Southeast Asia is home to the infamous "Golden Triangle" of countries comprising Laos, Myanmar and Thailand, once the world's major supplier of opium, but overtaken by Afghanistan since 1991. Eradication efforts in the past few decades have slashed opium cultivation in Southeast Asia to about 5 percent of the world's supply, although the region is now battling the production and consumption of amphetamine-type drugs. Most opium cultivation in the Southeast Asian region still takes place in these three countries, mostly in Myanmar; from there the drug is shipped primarily to China and Vietnam, although it is also distributed worldwide. The UNODC says a combination of political instability in Myanmar, and falling commodity prices over the past year has tempted farmers to turn back to poppy growing. "We have prices of commodity items such as maize and rubber dropping more than 50 percent, and at the same time we have seen an increase in opium prices," said Leik Boonwaat, the UNODC's representative in Laos. "Demand has been stable, the prices have increased and this has made it more tempting for farmers to increase production," he said. The Myanmar government has maintained ceasefires for years with a number of ethnic groups, including those in the country's east, who have been allowed a certain degree of autonomy. However, pro-democracy activists say the government has now told these groups they must join a government border-patrol force, sparking fears of armed confrontations. "Increased instability in northeastern Myanmar is affecting the opium market," wrote UNODC's executive director Antonio Maria Costa in the report's introduction. "Ceasefire groups - autonomous ethnic militias like the Wa and Kachin - are selling drugs to buy weapons and moving stocks to avoid detection," he said. Cultivation has increased for the third consecutive year in Myanmar, with opium-producing land increasing by 11 percent compared with the previous year and 50 percent since 2006 to a total of 31,700ha, according to the survey. More than one million people are involved in poppy cultivation in Myanmar, where 95 percent of the poppy is grown in northeastern Shan state, it said. In Laos, cultivation was up 19 percent to a total of 1,900ha and opium is fetching a high retail price of US$1,327/kg, compared with the farm-gate price of $317/kg in Myanmar. Boonwaat attributed the difference to a scarcity in demand and a population of some 12,000 drug addicts in Laos. To stem the cultivation, governments and donors needed to maintain vigilance and continue their support to help poppy cultivators find alternative livelihoods, the UNODC said. "It's in areas where alternative development has had a chance to take place that we've seen less opium, and in places that are more isolated and remote that we are seeing more opium growing," Boonwaat told IRIN.